Samsung’s plans about the “Galaxy Note” series has never backfired. These devices have always done a great job, though Samsung has priced every smartphone of theirs higher than what they can be valued at, but rarely people have complained about the price of the Note series. This time, another bold step taken by Samsung as they priced the Samsung Galaxy Note 4 at a higher price point. Whether it does the justice to the pricing, can be judged only after using it and understanding how the company has upgraded the Note 3 into a better one, but for now, here’s our hands-on. First look, this is huge. It easily feels heavier, although it’s not more than 8 gm heavier than the Note 3, but still the metal band on the sides makes this feel more like a premium and heavier device than it is. For the size, the Note 4 doesn’t have much of a difference again but the 8.5mm thickness makes this look like a beast, and for sure one of those phablets you cannot easily play around with one hand. It of course is comfortable with the metallic side and curvy edges, but we are talking of the usage here, which is hard for users who have a habit of one-handed usage of smartphones. 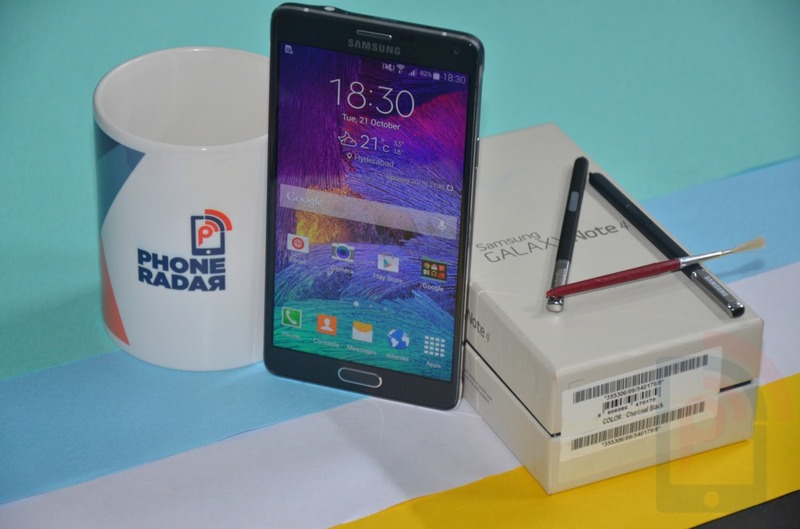 For those who are wondering about an upgrade from the Note 3 to Note 4, you are assured to be taken on a smooth ride. No big changes, but excellent upgrades to the features that matter for user experience. For example, the QHD display, the improved camera and the S Pen. Firstly, the display size is kept the same – 5.7-inch, but the QHD resolution adds to the big improvements (although still the QHD resolution doesn’t make much sense to me), because there are no visible pixels, and to add to that, Samsung has used the SuperAMOLED type display to make it vibrant and colorful. The viewing angles are great, and the curved screen towards the corners given it a great overall look. It was always the plastic design that people criticised about, but Samsung chose Galaxy Alpha to introduce something new, at least in terms of design – with a metal band on the sides. And the same is now seen on the Galaxy Note 4. It looks premium, two reasons for that – 1. the chamfered edges not just feel good, but they reflect the light and look classy, 2. the raised corners on the left and right side. It is because of the addition of metal, that we can now see the improvements in the buttons as well. Sturdy, hard to press and no where like the standard Samsung phone buttons that we have been seeing since years. The back cover of the device is not flat, as it gets raised near the camera, over the headset jack area, and it curves down towards the sides. One noticeable difference from the Note 3 is the shifting of speaker from the bottom frame to the back of the device, which I might find a little annoying. Also, the leather stitch that was added in the Note 3, is removed and here you get the similar texture extending till the corners. Just below to the 16-megapixel camera is the flash and a heart rate monitor, just like in the Galaxy S5 and Galaxy Alpha. The camera lens is raised and although annoying, it is unavoidable (but don’t we see the G Lens in the Xperia series not protruding out?). On the top, is the 3.5mm headset jack, secondary mic and the IR blaster, and in the bottom, there are two mics, assisting in better noise suppression. According to Samsung, the S Pen is hugely improved, and I should give it some time to understand what changes are brought into it, although this is not with the hardware part but with software enhancements. It has always been a better interface for me on the Note series than on the flagship “S” series from Samsung, although it is the same TouchWiz, but the options to take advantage of the S Pen, make it rather interesting. The phone runs Android 4.4.4 KitKat and there is some bloatware that Samsung has never hesitated to pack in, as we see Galaxy Apps, Evernote, Flipboard, Dropbox, Smart Remote, Magzter, SnM, Pages Manager, TripAdvisor apart from the standard Google Play apps, as well as a few apps such as S Note, Scrapbook for the S Pen. For the early tests, the device is swift in response, never gave up with anything during the first day of usage and we did a lot of multitasking, gaming and Internet browsing already, but never saw the Note 4 breaking a sweat. Dealt with each of it very well, with a good pace. Though, these were all our initial impressions, and the review would be up soon, to share our actual thoughts about the long-term usage of Note 4.